Summary: This article from the Northwest Missourian highlights some of the facility needs Convergence Design will be addressing in a study for Northwest Missouri State University. The project kicked off with meetings in Maryville on February 14. Redshirt sophomore Luke Lawyer takes swings in the cage while teammates find room to practice behind him. Surrounded by concrete pillars and walls, somewhere in the basement of the Lamkin Activity Center, lie three batting cages. This is where the Northwest baseball and softball teams practice. The Bearcats make due with this indoor facility as they prepare for the first part of their season. Sometimes they can practice in the limited gym space above, where players throw longtoss with rubber balls to prevent damaging the basketball court. The team has had limited access to its field leading up to the second weekend of games, which comes as no surprise to anyone familiar with Maryville’s weather in January and February. Head coach Darin Loe said he believes an upgraded indoor facility could benefit the team in many ways. “We put guys into competitive situations,” Loe said. “But if you had that indoor facility where you could almost scrimmage in there, even if it’s just an infield scrimmage, you could see where the ball flies. You could see if it’s a fly ball, line drive or ground ball. The baseball team is not the only spring sport that has to work around schedules that come with using the facility. The softball team, indoor track and field team, tennis-all spring sports use the same facility at one point or another, working to share space and time. 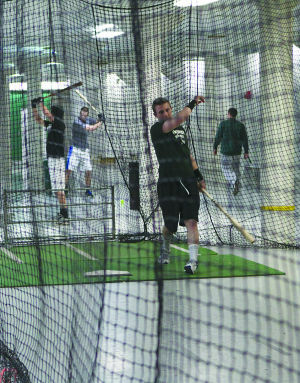 Senior outfielder Jon Pomatto said that the state of the indoor facility has its pros and cons. “It’s good, compared to a lot of other places, but it definitely could get better,” Pomatto said. “Our batting cages are a little outdated, and everything down here seems a little cramped because this is where the rest of the athletes are. A facilities upgrade is a possibility, but Wren Baker said some of Northwest’s MIAA competition has already begun to upgrade. “From a purely athletic perspective, Pitt’s building one, Western has one,” Baker said. “Hays is building one, and there are two or three other schools that are talking about it. Baker said the University is looking to develop a new indoor activities center through the next capital campaign. Baker said University officials are speaking to an architect who could meet with students and coaches to throw out concepts and ideas. New indoor athletic facilities would benefit more than just student athletes, hosting activities for all students that could include anything from laser tag to boat and R.V. shows. Loe said an upgrade could benefit the baseball program in many ways, one of them being the ability to recruit prospects. Baker, like Loe, said he realizes the benefits to such a facility when it comes to helping a team that went 18-32 last season.